To celebrate the Winter Games, the Austrian Mint in Vienna has issued two silver 5 Euro coins. Each displays a winter discipline in which Austria is a world-leading performer. The first has as its theme ski jumping. One sees the helmeted ski-jumper captured in his flight from the end of the steep ramp against a background of trees in an alpine forest. The second design shows a female snow-boarder as she performs a hair-raising air trick, flipping her snowboard up over the rim of the half-pipe in which they perform. The second 100 Euro coin in the gold series "Crowns of the House of Habsburg" will be released on Wednesday, 4th November. It is dedicated to the so-called "Archduke’s Hat", a name derived from the red velvet cap within the crown itself. The title of archduke was invented by Rudolf IV in the spurious document of 1358/59 called the privilegium maius. It was an attempt to assert the status of the House of Habsburg as the equal of any Prince Elector of the Holy Roman Empire. There exists a mediaeval portrait of Rudolf wearing a crown similar to the Archduke’s Hat. Early versions of the crown have not survived, being either broken up or melted down. In 1616, however, Archduke Maximilian III of Tyrol had the present Archduke’s Hat fashioned and he gave it to the Augustinian Abbey of Klosterneuburg just outside Vienna in honour of St. Leopold, whose tomb and shrine are still situated there to this day. The crown was not worn as such. There was no coronation. It was rather a symbol of authority and rank. It was brought into Vienna only for the ceremony of homage paid by the Estates of Lower Austria on the accession of a new Habsburg ruler. Even today the crown is not permitted to be outside the walls of the abbey for more than 30 days at a time. Twenty years ago in 1989 the Austrian State Mint passed from the Treasury into the ownership of the central bank. The mint was given the freedom to produce and sell products in accordance with the demands of the modern numismatic and investment markets. 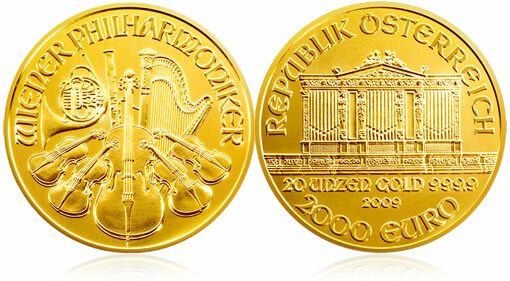 One of the very first innovations introduced by the new CEO, Paul Berger, was the production of a gold bullion coin for investment purposes: the Vienna Philharmonic. On 16th October this year a limited quantity of 6,027 Vienna Philharmonic coins, each weighing 20 ounces of fine gold, will go on sale in Europe, America and Japan. 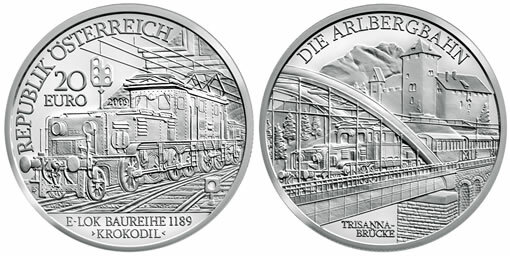 The fifth coin in the series "Austrian Railways" to be issued on 17th June, 2009, is dedicated to the electric train. What began as a fair ground attraction in 1880 in the Vienna Prater rapidly became the most revolutionary step in transportation since the harnessing of steam almost a century before. The first electric train in Austria was a small locomotive circling in the great exhibition pavilion in the Prater on the occasion of the Emperor Franz Joseph’s 50th birthday. The same monarch issued a licence two years later in 1882 for the first public electric railway. It used direct current and was a five kilometer long stretch carrying day-trippers from the country town of Mödling into the popular Brühl valley. Other short branch lines soon followed. The introduction of alternating current proved the most reliable for longer railway lines, and in 1911 electric engines using alternating current were put into service on the 90 kilometer stretch to the pilgrimage centre of Mariazell. Within its theme of "Austria and its People" the Vienna Mint begins a new sub-series of six silver 10 Euro coins called: Tales and Legends in Austria. 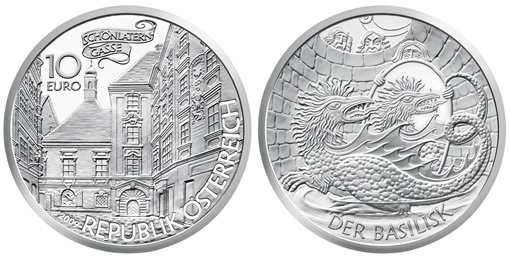 The first coin is dedicated to a mediaeval legend from Vienna – the Basilisk. It will be issued on Wednesday, 15th April. The story goes that in the year 1212 a baker’s boy in a shop in the Schönlaterngasse (Lovely Lantern Lane) No. 7 discovered a horrible monster at the bottom of a well. The stench and poisonous fumes of the creature killed all those who inhaled them. The monster was identified as a basilisk, a mutant creature part snake, part toad, part cockerel. To look into its eyes was instant death. A counsellor learned in such matters was fetched to help and to advise. He said that the only way to destroy the monster was to confront it with its own horrid appearance. Someone must go down into the well with a mirror. 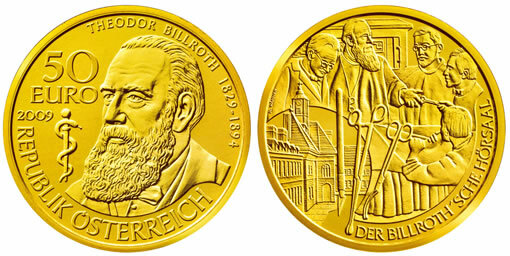 On 11th February, 2009, the Austrian Mint honours one of the greatest men in the history of medicine with its third gold coin in the series "Celebrated Physicians of Austria" – Theodor Billroth. Born on the island of Rügen off the Baltic coast of Germany in 1829, Theodor Billroth had to choose at an early age between his love of music and a career in medicine. He studied in Göttingen and Berlin, and even spent a year studying in Vienna. He gained experience in Berlin and his reputation grew so rapidly that in 1860 he went to Zurich as a professor of surgery. In the following years he rejected posts in both Rostock and Heidelberg, but accepted a teaching appointment in Vienna in 1867.